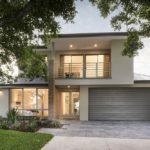 The Treehouse, is a beautifully designed by New Level Homes and meticulously constructed 302 square metre family home that will suit a 15 metre wide block. The elevation blends feature brick with the standard render, as well as a spacious and relaxing balcony to take advantage of the natural light and shade throughout the day. This entry was posted in bathroom, bedroom, house, kitchen, living and tagged bathroom, bedroom, house, house idea, houseidea, kitchen, living, New Level Homes, The Treehouse, villa on September 26, 2017 by admin.